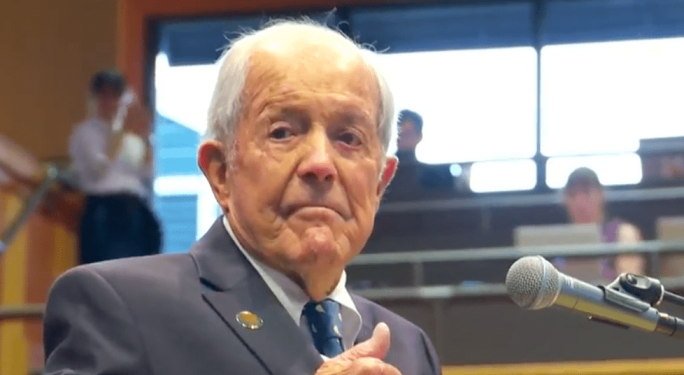 In a year with only one modern entrant into the National Museum of Racing and Hall of Fame, much of the induction ceremony focused on some of the sport's oldest and greatest names. At the program held Aug. 3 at the Fasig-Tipton Pavilion in Saratoga Springs, N.Y., racing's most familiar historical names dominated the card as the Hall took on 12 Pillars of the Turf, two historic review committee inductees, and a lone modern entrant in filly Heavenly Prize. This year's Pillars of the Turf included Elias J. “Lucky” Baldwin, August Belmont I, Cot Campbell, Penny Chenery, John W. Galbreath, Arthur B. Hancock, Sr., Hal Price Headley, John Morrissey, Dr. Charles Strub, William Collins Whitney, Harry Payne Whitney, and Cornelius Vanderbilt Whitney. Many Pillars of the Turf found success as owner/breeders as well as racetrack founders/executives, or in some cases both. Several are credited as having built farm and racing stable empires which have continued today with future generations. The inductions of Arthur B. Hancock, Sr. and Hal Price Headley were observed by descendants who each took up nearly a section of seats in the pavilion, many of whom remain active in the business. Arthur Hancock III accepted the Hall of Fame plaque on behalf of the Hancock family and took a moment to salute his grandfather's perseverance in the early years of what would become Claiborne Farm. Hancock married Nancy Tucker Clay in 1908 and two years later, Clay inherited 1,300 acres in Kentucky. The Hancocks were left to juggle operations both at their existing propertly at Ellerslie Farm in Virginia and to overhaul the infrastructure in Kentucky. Hancock would go on to be the country's leading breeder by wins eight times, president of the Thoroughbred Horse Association, and importer of a number of foreign stallions, including sires of two Triple Crown winners. His family has since carried on via Claiborne and Stone Farms. 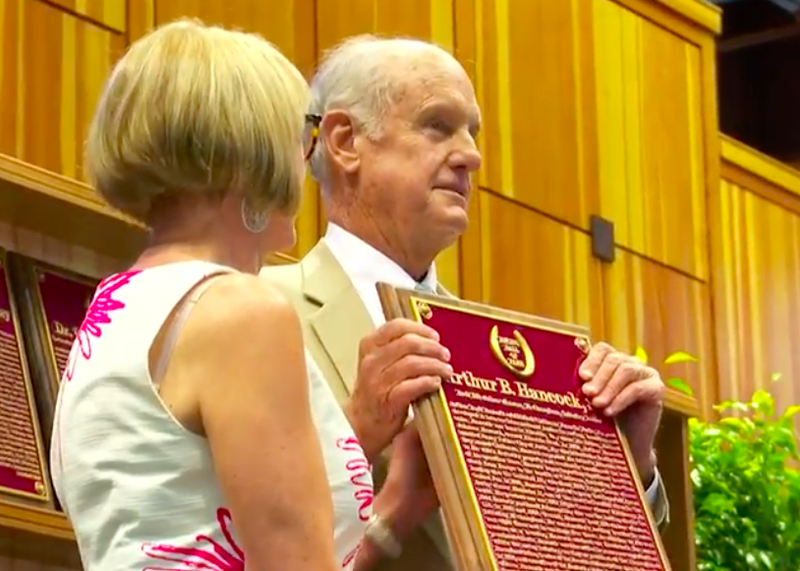 John Phillips, grandson of Galbreath and owner of Darby Dan Farm, said his grandfather would have been “tickled” at the honor of a Hall of Fame induction. Cot Campbell was the twelfth and final of the Pillars of the Turf to be honored on stage – and the only one accepting his own plaque. Campbell, who pioneered the syndicate model with his Dogwood Stables, received a standing ovation upon approaching the mic. He estimates 1,200 people got into Thoroughbred ownership via Dogwood. Preakness, the namesake of the second jewel of the Triple Crown, was remembered for his dominance in the 1870s for owner Milton Sanford. Trainer Shug McGaughey was on hand to look back on the career of Heavenly Prize, who won eight Grade 1s and an Eclipse Award for the Phipps Stable. The Museum also announced the start of a overhaul to the Hall of Fame, which will modernize that section of the building and make it into a multimedia experience. John Hendrickson estimated the project, which will create a digital presentation for each inductee, will cost approximately $20 million and will be in place by 2020. “I believe it will be one of the most important thing that this industry has done in this sport in our lifetimes,” said Hendrickson, who announced he and wife Marylou Whitney are committing $1 million to the project. This entry was posted in NL Article, People and tagged Arthur B. Hancock, August Belmont I, claude shug mcgaughey, Cornelius Vanderbilt whitney, cot campbell, Dr. Charles Strub, Elias J. “Lucky” Baldwin, hal price headley, Harry Payne Whitney, Heavenly Prize, john morrissey, john phillips, John W. Galbreath, Kate Chenery Tweedy, penny chenery, Phipps Stables, Sr., William Collins Whitney by Natalie Voss. Bookmark the permalink.